The Bank of Portugal announced today that the public debt stock increased by €2.1bn in October. New debt issuance explains the increase. The public debt stock increased by €2.1bn in October, according to the BdP (Bank of Portugal), reaching a total of €251.1 bn. It has now surpassed the previous record high of €250.52bn registered in May this year. The increase is explained by the increase in issuance of treasury bonds. The data was released today by the BdP. 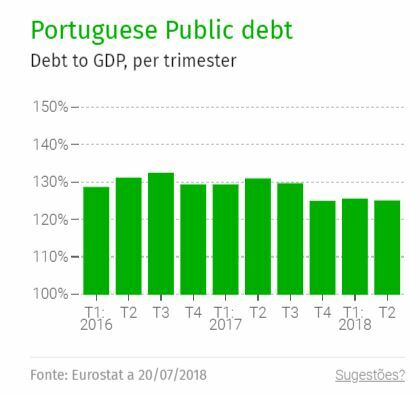 According to the institution, led by Carlos Costa, the Portuguese debt, calculated within Maastricht’s convergence framework, was at €251.1bn in October. This represents an increase of €2.1bn in comparison to September. The new maximum high’s news occurs a few days after the Prime Minister of Portugal announced that the country will repay the remaining debt to the IMF by the end of the year. The announcement was made on the occasion of the country’s State Budget debate at the Parliament.